The Cruze Sedan is known for its elegant design and dynamic features. Now with enhanced safety and refined styling, this firm favourite has arrived at a new level of performance and driving prowess. Most significantly, the Cruze is now fitted with all new turbocharged powertrain, giving it a serious competitive edge. Chevrolet offers the 2014 Cruze in LS, LT, Eco, LTZ, and Diesel trim levels. Upgrading to LT trim adds cruise control and aluminum wheels, while the Eco model is equipped with Chevrolet MyLink technology, aerodynamic enhancements, and forged aluminum wheels. A 2LT Package includes leather seats, heated front seats, a power driver’s seat, and more. 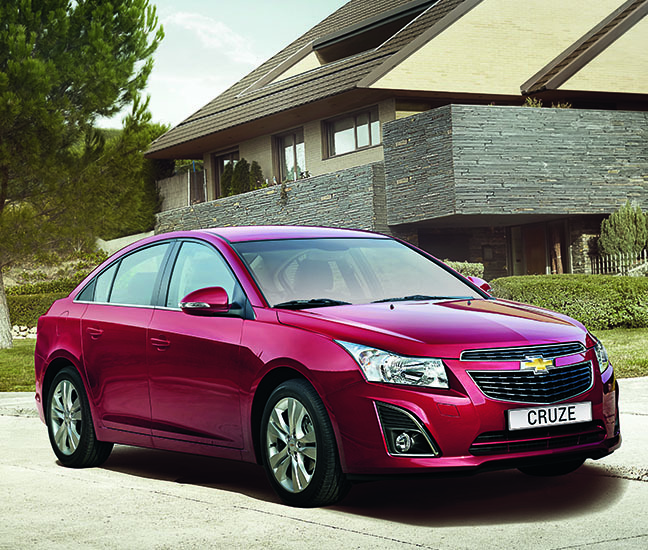 The Cruze Diesel is equipped with the 2LT Package as standard equipment. When equipped with LTZ trim, the Cruze includes automatic climate control, keyless entry with push-button starting, remote engine starting, a reversing camera, fog lights, and bigger aluminum wheels. Depending on the model selected, the Cruze can be optioned with a power sunroof, a premium audio system, navigation, safety technology upgrades, and more. A 1.8-liter 4-cylinder engine is standard for the Cruze LS, making 138 horsepower that’s fed to the front wheels through a 6-speed manual gearbox or a 6-speed automatic transmission. The Cruze LT, LTZ and Eco models have a turbocharged 1.4-liter 4-cylinder engine and a 6-speed automatic transmission. Like the Cruze LS model’s engine, it generates 138 horsepower. The difference is that the power is made lower in the engine’s rev range, and the turbo motor also makes more torque at lower rpm. The net result is better performance combined with better fuel economy. For the greatest levels of performance and fuel efficiency, try the Cruze Diesel. Its turbocharged, 2.0-liter 4-cylinder diesel engine produces 151 horsepower and 264 lb.-ft. of torque. That’s 116 lb.-ft. of torque more than the turbocharged 1.4-liter in the LT, LTZ and Eco models. A 6-speed automatic transmission is standard for the Cruze Diesel. Fuel economy ratings for Cruze models with gasoline engines range from a low of 22 mpg in the city for the Cruze LS with an automatic transmission to a high of 39 mpg on the highway for the Cruze Eco. The Cruze Diesel is rated to return 27 mpg in the city and 46 mpg on the highway. The 2014 Cruze receives a 5-star overall crash-test rating from the National Highway Traffic Safety Administration (NHTSA), the highest score possible. The Insurance Institute for Highway Safety (IIHS) has not rated the 2014 Cruze as this summary is written. Last year, the Cruze was named a “Top Safety Pick” but the car had not been subjected to the tough new small overlap frontal-impact test. Every 2014 Cruze is equipped with OnStar telematics and includes a free six-month subscription to service. That includes Automatic Crash Response, which automatically sends rescuers to the car’s location following an airbag deployment. The Cruze is also offered with a reversing camera, Chevrolet MyLink connectivity and Bluetooth audio streaming, a navigation system, and an Enhanced Safety Package containing Rear Cross Traffic Alert and Side Blind Zone Alert systems.